The SeaCross navigation system is a modular, scalable system specially designed to meet high-speed operation requirements in littoral, coastal and open waters. Established in Scandinavia, SeaCross was developed based on the experience and knowledge derived from high-speed crafts operating in challenging navigational environments. The system is deployed by many different vessels worldwide in applications such as Special Forces, police, firefighting, coastguard, search-and-rescue (SAR), and naval vessels. Installations range from submarines to high-speed patrol vessels. SeaCross comprises an intuitive, easy to understand and operate user interface, and is equally operable for onshore planning and navigation at high speeds, heavy seas and low visibility. After minimum training, a navigator can access and full system functionality. 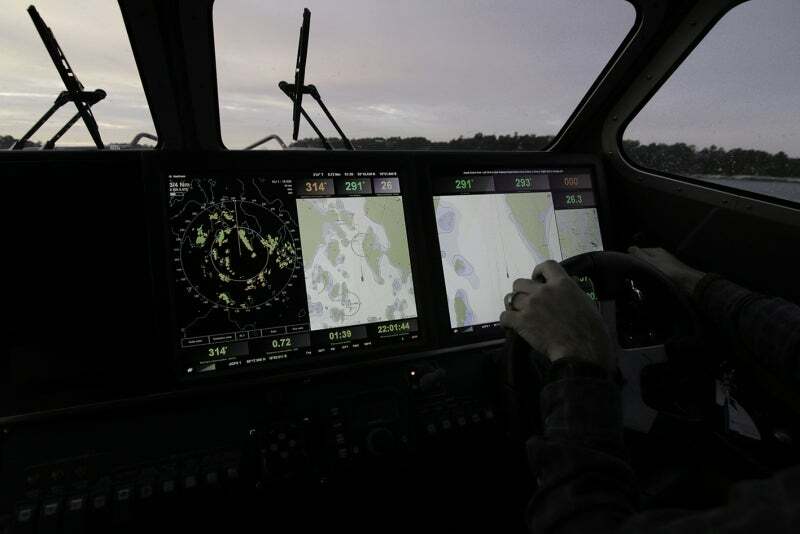 The system’s mission-oriented user interface implements a template approach, with which the navigator can switch between different operational modes such as high-speed, low-visibility, coastal, landing, planning or open-sea-crossing. All customisable templates are automatically stored and interchangeable between onboard or onshore SeaCross units. The number of definable templates is not limited, and templates are recalled with one click. The SeaCross® features built-in estimated position / dead reckoning (EP / DR) navigation functions, which require compass and log input. When spoofing, jamming or other sensor failures cause the loss of data, navigation routinely switches to EP-mode. In this mode, SeaCross uses the best available sensor input at any time to analyse the position, speed and heading, which is a combination of hdt, hdg, cog, sog, stw and / or manual operator input. EP-mode can also be activated on operator command. Each template can consist of one or several picture-in-picture (PIP) windows, where each window can be individually sized, positioned and filled with any combination of more than 200 inherit functions. These include sea charts, radar, trip meters, navigational aids, automatic identification system (AIS), echo sounder, sonar and engine data. Entire templates or individual windows can be tailored with selectable colour schemes, brightness and selectable instrument data representation. SeaCross is designed for high-speed navigation in littoral waters or high seas, and offers unique functions dedicated to instantly convey relevant information for optimal situational awareness and interpretation. The system is designed for vessels reaching speeds of up to 100k, offering unparalleled real-time update and overall system performance. With the SeaCross NTE function, radar images are instantly differentiated to display charted and non-charted radar objects differently. The SeaCross RBU function combines radar images with safe water and chart overlay information selectable in layers and detail. Cross-window and cross-unit linked cursors allows for simplified object identification. The SeaCross high-speed automatic radar plotting aid (ARPA) function offers 30s down to instant target acquisition and tracking. All radar antenna models are capable of 48 revolutions per minute (RPM). SeaCross supports up to four separate simultaneously operating radars, which facilitates immediate switching between different transmitting technologies as appropriate, accommodating for alternating needs of LPI, short / long-range, high-definition or non-jamming radar technologies. All display units are dimmable by up to 100%, and feature an optional night-vision imaging system (NVIS). In addition, all units have five different colour schemes ranging from day to night. Each PIP window can be individually dimmed, offering the navigator an even and properly contrasted display for a wide range of night operations. Although SeaCross units are autonomous, each installed unit will automatically communicate with any other unit as available. This allows for Linkage and Crosstalk, which means that scale, orientation and cursor pointers can be linked between radars and chart windows that allows quick image interpretation and target identification. Linkage and Crosstalk is also available between units, allowing the navigator to point out objects and targets on the helmsman’s displays. SeaCross is built on open standards. Incorporating sensor data, it uses a combination of NMEA0183, NMEA2000, CAN-J1939, USB and Ethernet. This allows for unparalleled backwards compatibility and future integration and additions of sensors compliant with these standards. Radar antennas are operated using the individual manufacturer’s proprietary protocol. The processor unit runs on a Windows OS, accommodating quick and standardised data transfer mechanisms in between onboard and onshore units. The open standard and modular design of SeaCross facilitates efficient integration with other systems and technologies, such as the existing integrations with Kongsberg Sea PROTECTOR RWS or The SEAL SDV mini submarine. The SeaCross system includes a standard training module that can be executed on any Windows compatible PC. This module comprises all of the SeaCross functionality but in a simulated sensor environment. In addition, the training module serves as a platform tool that can be used for route planning and preparation or mission template design. While in progress, all sensor data such as radar and operator interactions can be recorded to a standard file. A recording can be replayed, using the training module onboard or onshore, for debriefing purposes. The SeaCross system platform entails a self-configuring setup and diagnostics system that automatically identifies connected and supported sensors. Each sensor’s data stream can be examined and tailored. The diagnostics module checks data streams for discrepancies, and presents the diagnostics test results in human language. Born in Scandinavia and based on extensive experiences from high-speed navigation in archipelago waters, the SeaCross® system was introduced to the market in 2006.